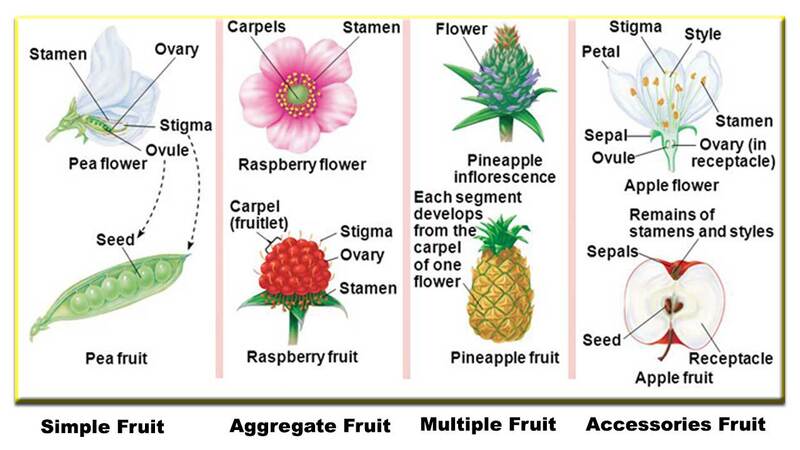 There was 4 fruits type in the world ; simple fruit, aggregate fruit, multiple fruit and accessories fruit. Below are the definitions of each type so you can see the differences between them. Simple fruit is also known as a single fruit is a fruit that is formed from a single flower with a will fruit. examples of simple fruits include: apples, mangoes, rambutan and avocado. 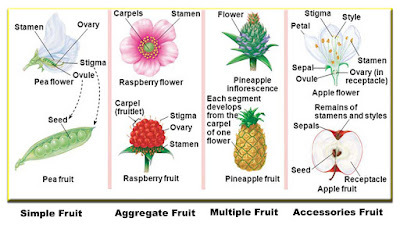 The aggregate fruit, also known as the double fruit, is a fruit that is formed by many will come from a flower, each fruit will grow into its own fruit but eventually become a collection of fruit that looks like a fruit only. Examples of fruits that are classified as aggregate fruit include: strawberries, soursop and srikaya. Multiple fruit is a fruit that is formed from the will of fruit along with other parts of the flower, but other parts that actually become the main part of the fruit. Because it is a false fruit is also often called by the name of a closed fruit. Examples of multiple fruit, among others, are jackfruit, pineapple and guava monkeys. Accessories fruit are fruits whose fleshy parts usually do not come from the ovaries, but come from several adjacent tissues. Examples of accessories fruit including strawberries.